Dee Williams built her Tumbleweed tiny house several years ago for about $10,000 from a lot of reclaimed building materials, which helped keep the cost low. So besides being a tiny house, it’s an excellent example of how used building materials can be taken out of the trash and made new again. I first saw this story on RowdyKittens. Read the whole story about Dee Williams on the PBS website. Also be sure to visit Dee’s tiny house website, Portland Alternative Dwellings. This entry was posted in Announcement, Video and tagged dee williams, oregon, PBS, portland, rowdykittens, tiny house. A nice video on Dee’s home. I bet a lot more people get interested now. After they see that Dee was able to build one herself, they should be able to as well. I may not be as fast as Dee, but I will finish mine soon. Dee Williams is my hero! 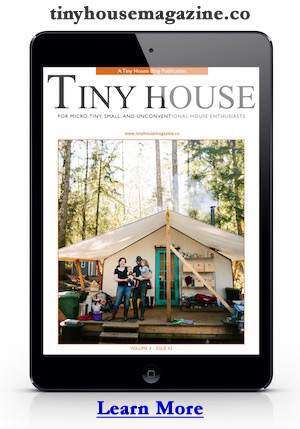 I’m planning on going to the tiny house building workshop that PAD does next year. Dee has built her own home. That was great to see. I would like to build myself a small home. I just need more space. I will wait to see how others are building larger small homes on wheel. I am a person who needs to be actively doing things. The small house does not allow space to do anything. I am happy that the trend is catching on. Small beginnings are leading to better and better design. Perhaps a taller upstairs and a sofa bed can help utilize the space better. I am an interior designer. I am constantly looking a ways to use built-in components along with small functional kitchen and bath designs within smaller spaces. I agree that we are a nation of over consumers. Our needs are not as great as we think they are. I will be keeping up with this growing industry. Best wishes on the new business venture of the small house construction company. Perhaps more of us can become home owners.